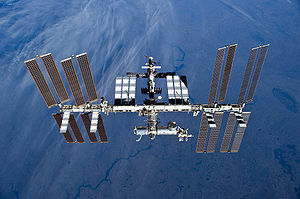 Construction on the International Space Station (ISS) has been ongoing since 1998, and is only scheduled for completion next year. Meanwhile, as the last few sections get lifted into place, it is already big enough to appear as the brightest star in the sky when it shoots past overhead. Here is a fantastic video recorded by the crew of a recent mission giving a guided tour of the interior of the station. The fact that it takes a full six minutes to “fly” from one end to the other should give some idea of the scale of what has been achieved in putting ISS in orbit.